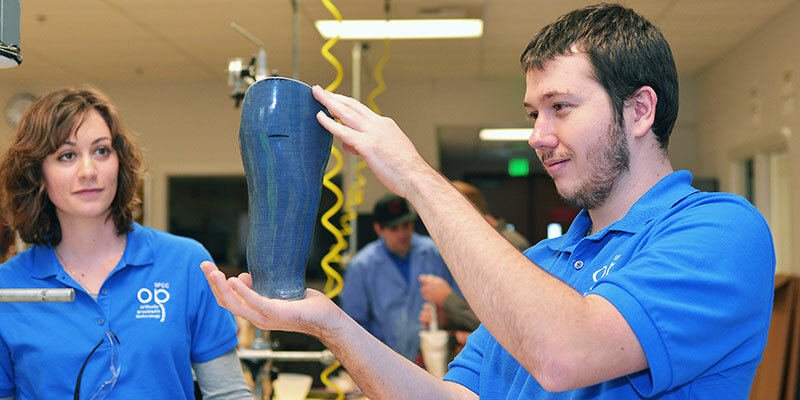 The orthotic-prosthetic technician program is housed in the Technical Arts Building on the campus of Spokane Falls Community College. Students train in a 9,000-square-foot laboratory designed to closely duplicate a large, state-of-the-art O&P facility. The main lab contains individual workstations and is surrounded by specialized rooms that house equipment specific to the fabrication process. The adjoining 1,200-square-foot classroom 110 is used for course lectures and guest speaker presentations. The 2,800-square foot main lab provides abundant room for each student to work and learn in a safe, well-lit environment. Each student has his/her own workstation consisting of a rock maple workbench, appropriate vises and bending fixtures, and alignment equipment. Storage lockers are provided for projects and personal belongings. The plaster room is a large, bright work area where students build plaster forms called "positive models" that are used for creating many kinds of orthoses and nearly all prostheses. Students learn how to use power equipment for fabricating, modifying and finishing metal components in the metal fabrication room. Equipment includes drill presses, grinders and buffers, bead blasters, and band saws with duplicate machines so students don't have to wait for access. The room is large with generous space between each piece of equipment for a safe work setting. The sanding room is equipped with machinery used to trim and polish plastics for braces and limbs and to shape prostheses. In addition to normal shop equipment, there are six socket routers specifically built for the orthotics and prosthetics industry. A high volume dust collector reduces particulates in the air for healthier breathing. In the plastic room students learn to fabricate limbs and braces using laminates, resins and vacuum-formed thermoplastics. Two large convection ovens and an infrared oven allow students to heat the plastics used for molding orthopedic braces. There are numerous vacuum stations for laminations and an excellent ventilation system to help control fumes from the plastic resins. The sewing room is used to produce leather and fabric components that are used on braces and prosthetic limbs. Belts, straps, and suspension components used to secure devices are custom made for each patient. This area is also used to perform shoe modifications for adaptation to orthotic components. The room contains large work tables and industrial sewing machines. The Competency-Based Education lab is available for students to access multi-media learning resources as part of the O&P curriculum. Students also use this area for taking quizzes, tests, and accessing the Internet for research. This 1,200-square foot classroom is used for course lectures and guest speaker presentations.